My childhood didn’t involve family dinners. Perhaps because I didn’t really have a family in the traditional sense, and perhaps because I did a lot of the cooking from a very early age. It wasn’t until college that I really started to notice the value in sitting down to eat a meal and enjoy conversation. After I got married, my husband’s childhood memories of family dinners made a huge impact on me, and I knew it was a ritual I wanted for our family one day. Connecting around the kitchen table with family dinners makes something magical happen. Family dinners aren’t just about eating. It’s a pause in an otherwise busy day to sit, reflect, share, listen, and just be with the ones you love. As a child, my family wasn’t alone in skipping nightly meals together. It’s easy to see how dinner can be conveniently overlooked with access to fast food, convenience foods at every grocery store, and overscheduled days. But research and personal experiences shed light on what we are sacrificing for convenience. I knew I wanted a different experience for the family my husband and I were creating together. When our first child was born, so was our family dinner ritual. Seven years later, family dinners continue to ground us and have become a welcomed time in our day that everyone looks forward to. Honoring the ritual of consistent family dinners offers each member of the family sacred time to connect and enjoy each other’s company every single day. Family dinners also offer natural moments to reinforce manners, sharing, and the art of conversation. Consistent family dinners make space for honesty and vulnerability; it’s hard to hide disappointment, excitement, or nervousness when surrounded by comforting food and relaxed pauses in conversation. Soon it becomes natural to share and to listen. To stop chewing with your mouth open and to pass to the left. It becomes natural to know the peace and ease that comes with intentional fellowship and security. Consistent family dinners can quickly become an anchor to those inevitable hectic days or seasons. For years, researchers have been unearthing the benefits of frequent family dinners. With younger children, cultivating a family dinner ritual creates an atmosphere where families can navigate bigger issues with more grace and effectiveness during those teen years. When we honor and listen to our younger children’s worries and stories, they will be more likely to share those bigger, often scarier, issues as they grow into young adults. But how is an already busy mama supposed to plan, shop, prepare, and clean up after dinner seven days a week? 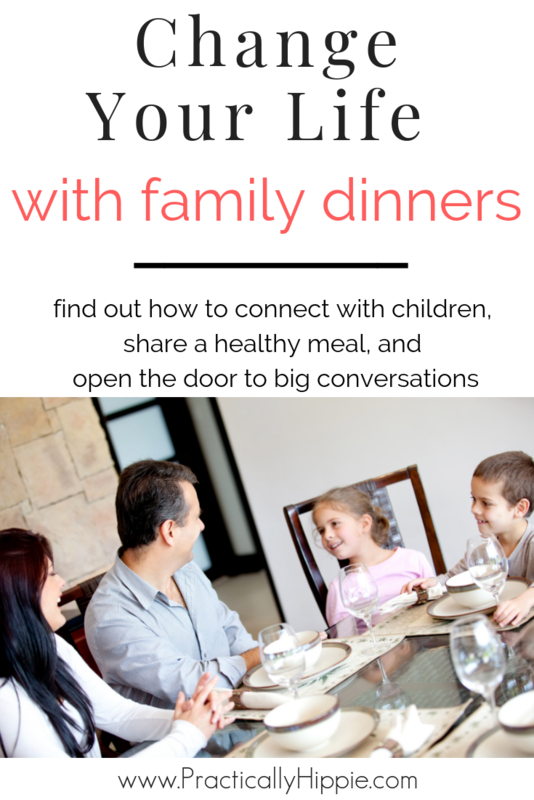 Of course we all know that planning is key to our days running smoothly, but there are some other tricks and tips that can help create stress free, special, and intentional family dinners. The first step to creating a family dinner tradition is realizing that others can help. In fact, I’m going to bet that your kids will be begging to assist in the kitchen, especially once the occasional dinner prep becomes part of your family’s daily rhythm. Kids love to peel vegetables, arrange food on platters, and set the table. It just means us mamas (or dads) need to embrace letting go of the control we may have in the kitchen. Yes, it’s going to be a bit messier and take longer, but not forever. If you need some ideas on how to get started cooking with kids, check out my free printable with 100 ways kids can help in the kitchen. Involving our children with meal preparation offers many opportunities for kids to learn the art of cleaning up as they go, to be genuinely helpful, and to learn kitchen skills that will be beneficial for a lifetime. One of our family mottos is “many hands make light work” and that is so true in the kitchen. Get everyone involved in clearing the table, loading and unloading the dishwasher, or hand washing those dishes. When visiting family or friends, I jump at the chance to dry the dishes while they wash. There is something about sharing that specific task that always generates meaningful conversation. Planning. I know it’s an obvious step, but it’s also the most important piece to the family dinner puzzle. I have a master list of meals to make meal planning a simple, enjoyable task each week. I make an effort to invite our kids to help plan dinners by picking a favorite main and side dish for one night each week. I also use this as an opportunity to share special meals I had as a girl or to dig out old family recipes. Offering our kids the opportunity to pick our entire dinner once a week gives the children a sense of purpose and responsibility. Planning and shopping for nightly family dinners can be made simpler by grocery shopping online. Plan with the family or on your own, place your order after the kids are in bed, and pick up when it’s convenient. Placing online grocery orders has also helped in keeping our grocery bill in line with our budget. I’m a big fan of Walmart grocery pick up, and it seriously saves me hours every week! They have great organic options at the lowest price around. Try it yourself with my referral link and save $10 on your first order: Save $10 here! We also enjoy discussing the vegetables and fruits that are in season when planning our meals. Adding in a stop to a local Farmer’s market can make grocery shopping feel like a field trip vs another errand to check off the list. Don’t feel like every night needs to be a culinary masterpiece. Casseroles made over the weekend and frozen are wonderful, comforting meals for later in the week or month. The Instant Pot is a staple in my kitchen for whipping up quick meals- even frozen chicken! Roasting farmer’s market vegetables on the weekend is a great way to get ahead for weeknight meals. And leftovers are a perfectly acceptable dinner on any night of the week, too! It’s the atmosphere that we are creating as part of our family rhythms that matter here. Of course we want to feed our families nutritious and delicious meals, but we also want them to feel comfortable and welcomed to sit, talk, relax, and enjoy. Family dinners have so many benefits. We eat better food and stay healthier. We have great conversations, and opportunities to have those big juicy conversations. We can tell stories and test out new jokes. Family dinners set the stage for a lasting and positive family culture that keeps our kids showing up with empty tummies and full of stories long after they leave the nest. « Are Witches Good or Bad for Children?